Almonds belong to the most valued ingredients in Ayurveda. They have been an important part of the human diet since times immemorial. Soaking almonds overnight renders them several times more beneficial. It dissolves substances that can interfere with the enzymes in the digestive tract. 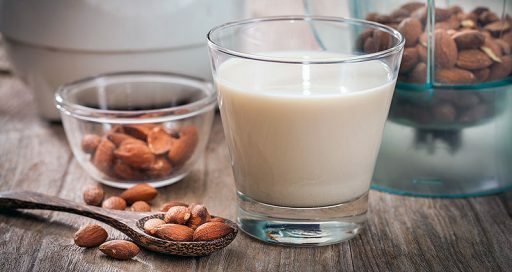 Toxins like amygdalin from bitter almonds that may be mixed in. There are many good reasons for eating almonds. If you have one of the following symptoms, try the mentioned recommendations. But even without symptoms of disease, it’s worthwhile to enjoy almonds daily. Almonds have a prebiotic effect. They support the growth of beneficial intestinal bacteria. Almonds protect against diabetes by increasing the response of the body cells to insulin (lower insulin resistance). Diabetic patients were able to significantly reduce their anti-diabetic medication. Almonds lower cholesterol levels within 4 weeks. Almonds increase bone density (20 percent reduced formation of osteoclasts, 65 percent less calcium release from the bones after almond consumption as compared to carbohydrates). In a study, almond consumption reduced body weight (62 percent more reduction in body mass index after 6 months, slimmer waist and reduced fat mass). Almond consumption lowered blood pressure by 11 percent (after 6 months). Reduced symptoms of metabolic syndrome after 6 months of daily intake (obesity, high cholesterol, high blood pressure, type 2 diabetes). Almonds are much appreciated in Ayurveda. They strengthen vitality in general and the heart and the eyes especially. They nourish the nervous system including the brain, and in fact the entire body. Ayurveda also values them as a source of strength during pregnancy, after giving birth, and in case of menstrual cramps. Almond paste. Almond paste is hard to digest, produces mucus and blocks the Srotas – i.e. the fine transport channels in the body. Almonds and dried fruits provide the best nutrients if they are organic. Soak almonds (with peel) in a jar or bowl with water overnight – take about 10–15, depending on the desired consistency. Also soak half a handful of dried fruits – such as dates, apricots, figs, raisins – in 300 ml of water. Use a second bowl or simply soak them in the blender jar. In the morning, skin the soaked almonds (if necessary, briefly quench with hot water), rinse thoroughly and add them to the bowl with the dried fruits. Don’t pour out the soaking water of the dried fruits! If desired, add aromatic spices (such as cardamom, cinnamon, saffron) and liquefy the mixture in a blender. For almond paste, soak the almonds for about 12 hours, then skin them and pound in a mortar or chop with a blender. Add a few drops of the soaking water. Almond paste is hard to digest, can form mucus and block the Srotas (the fine transport channels in the body). It increases Kapha and pacifies Vata as well as Pitta. 54–60 percent fat content with many monounsaturated fatty acids (oleic acid) and, to a lesser extent, polyunsaturated linoleic acid. 20 percent protein, provitamin A, vitamins B1 and B2, vitamin C.
Minerals such as calcium, potassium, magnesium, phosphorus, sodium, sulfur, fluorine and iron.